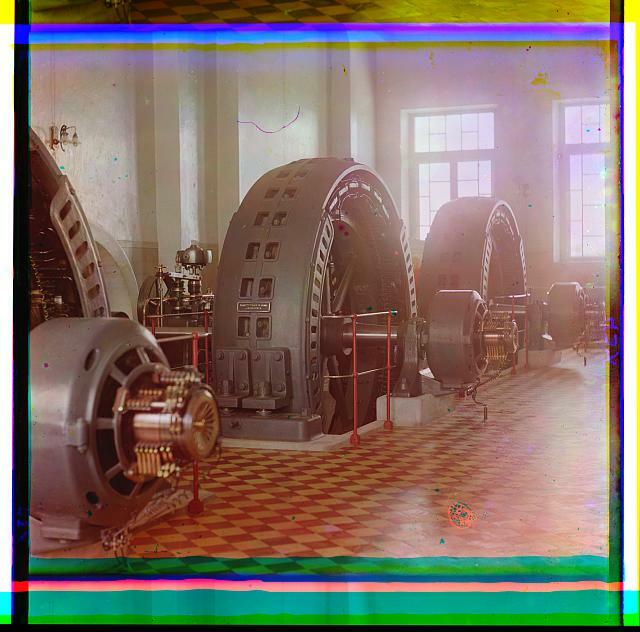 The photograph above, “Factory Interior with Electrical Generators” is from the Prokudin-Gorskii collection taken on the Murghab River circa 1910. These generators were imported from Hungary, which helps to give one an idea about Russia’s industrialization capacity in the early 1900’s. Before the Crimean war, Russia had a very weak economy with little industrialization compared to the Western European powers. This was in part due to serfdom and a greedy upper-class. However, after the Crimean war, Alexander II enacted various reforms including the emancipation of serfdom. This would pave the way for Russia to begin its process of industrialization. True industrialization didn’t kick off in Russia until the late 1800’s with reforms by Tsar Nicholas II and the minister of finance, Sergei Witte . Russia’s economy had a notable increase between 1890 and 1910, due in part to higher exports of natural resources and the expansion of the Trans- Siberian Railway. “Russia’s economic progress in the eleven years of Witte’s tenure as minister of finance was, by every standard, remarkable. Railway track-age virtually doubled, coal output in southern Russia jumped from 183 million pounds in 1890 to 671 million in 1900″(Llewellyn). The economic and industrial growth during this period would become the foundation of Russia later in the century. However, Russia still had a variety of problems when it came to industrialization and its side effects. One negative side effect of industrialization was the influx of population in Russian cities. Unlike other industrialized countries, Russia’s cities did not grow to accommodate their growing populations. Workers in the cities experienced poor and unsanitary living conditions as well as long hours with little pay. Due to the past history of serfdom in Russia, there was little technological advancements and people who had the capacity to create technologies for the industrial revolution. As a result, Russia suffered and ended up relying on other countries for the machinery and technology that was needed to sustain the growth of the revolution. The generators above give an example of how the foundation of Russia’s industrial revolution was based off of other countries. Russia also faced problems such as pressure from outside markets and typical international economic fluctuations. Other problems included a lack of venture capitalists and low labor productivity, as well as a struggling domestic market due to a largely poor population(Freeze, 217). Even though Russia had an industrial revolution with a variety of problems associated with it, the economic growth was something new that Russia needed which would help pave the way for Russia’s future advancements. Freeze, Gregory L. Russia: A History. 3rd ed. Oxford: Oxford UP, 2009. Print. Llewellyn, J. “The Russian Revolution.” Russian Revolution. Alpha History, n.d. Web. 31 Aug. 2014. <http://alphahistory.com/russianrevolution/russian-industrialisation/.>.